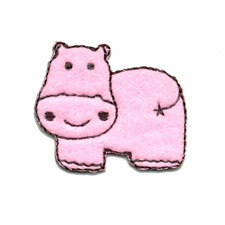 This hippopotamus felt applique is a great way to get an quick embroidered look without the time or equipment. Backed with heat-activated adhesive, the manufacturer recommends they be applied with an applique press, but a hot iron will do it as well. On items receiving a lot of wear and tear, you may want to stitch the applique down after adhering. Appliques measure 1 1/4" x 1 1/4". Please specify color. Preheat iron to the correct fabric setting. Use dry heat with no steam and press a cloth between the iron and the applique. Press and lift but do not move the iron back and forth. Press front 10 to 15 seconds and back 20 to 25 seconds. Allow to cool before testing bond. Add more heat if necessary. Do not iron appliques onto delicate fabrics. For best results, hand sew the applique on for long term security. Wash inside out.